Welcome to the Fin! Winter 2019 Issue. The newsletter of the Canadian Dolphin Swim Club. Hello Dolphins! The past few winter months have flown by and we apologize for the lack of monthly newsletters. We hope that this one will provide an update on the busy months of January and February, while we get back into a monthly schedule after spring break. Thank you to all the volunteers and families that helped out at our two hosted meets this year, it really was a group effort and we could not have done it without you! Congrats to all of the athletes who participated at Age Group and BC Provincial Championships!! Way to go FINS!! Congratulations to all swimmers and volunteers on a great meet that CDSC hosted in January! Well done to all. I thought the camaraderie amongst swimmers was great. Lots of younger swimmers attending and doing very well. Team cheers were a highlight of the meet with those near the end of the meet being even stronger. Parent volunteerism was at the highest level I have seen in years. THANK YOU to all who helped out and especially a thank you to our swimmers for competing at a high level and winning the meet! There seems to be a lot of flu symptoms going around, so it is important for swimmers to make sure to dress properly while going outside and to make sure to wash hands with soap and water after touching doors etc. so that you do not catch anything! Eat well, including lots of foods with vitamin C. Drink lots of water and do not share your water bottle at ANY TIME! We are now in a training stage where we will focus on increasing the aerobic component of our workouts and train. Our next meets will be in mid and late February so that the body can adapt to the training done and allow an adequate phase for a taper in to the competition phase later on in February as well as early March. Please make sure to keep your attendance high at this time because missing workouts will not allow you to accomplish your goals. We have been going through some various increases in dry land as well as metres within the water. The body will or should start to feel sluggish while swimming and you may be tired. This is part of the phase of training that you are doing. Again, stay hydrated, eat well and healthy (cut down on sugar) and when you start the taper, your body will adapt and be ready to swim faster. Challenge yourself every day. During practices, when doing speed work, it is imperative to go ALL OUT. At a meet RACE – which is being first to the wall, not focused on how it feels! Holding back creates a false sense of accomplishment. When doing descending sets, it is usually done by descending the times by small amounts and not descending by over 10 seconds. Having your goals beside you helps you to realize what you are working for. To have them written down and on a sheet of paper or your kick board, allows you to reinforce what it is that you are trying to accomplish. You are working on getting better for yourself but also you need to understand that thousands of others around the country are doing the same thing. What are you doing that is better than they do? How can you get faster, stronger if you are not willing to do something that is above what others are doing? When doing technique, focus on the task at hand – not racing during this time. When doing turns, focus on the speed it takes to get around quickly as well as proper technique. You do hundreds of turns or thousands per week – make every one count in order to make yourself better! Push yourself in practices and do not lay back at the end of the line all the time. We had a fantastic February with some great results. CDSC hosted the Winter Age Group Championships with great success! Thank you to all who helped in any way to make this a huge success overall. Many coaches and teams found our home pool to be a great facility to host such a large event. We had close to 500 swimmers attend with another 50 coaches and about 1000 spectators throughout the busy weekend. CDSC was winning the meet after the first day and continued to threaten right up until the last day of competition. We ended up placing 3rd, only 13.5 points out of 2nd place and within a couple of hundred points from first overall. Our team picked up 33 total medals to be second overall in medal count. It was a fantastic meet overall for our swimmers and a great experience to be able to swim in our own pool! Highlights of the meet included Jordan Luis picking up a total of 10 medals with one meet record, Alexia picking up 8 medals (along with 3 club records) along with our 10 & under girls picking up 2 Gold medals breaking club records. Maria, Alexia and Ridley also won events along with Jordan! Nathalie also broke a club record. Bronze medals: Nathalie, Girls 12 & u relay, Derek, boys 13 & u relay, Jordan (2), Noah, CONGRATULATIONS ON A JOB WELL DONE! Again, some phenomenal results for an early LC meet. The highlight being Maria picking up 3 WESTERN TIMES and one CJC TIME, to join Jordan with Western cuts and become the first swimmer this season to reach a CJC cut! This weekend our team travels to Kamloops for the last provincial meet of this cycle. Psych sheets are posted and although we are a very young team heading to Kamloops, we have some good chances to make second swims in multiple events. Our goal is to strive for more Western/ CJC cuts and gain experience for our swimmers heading in to the summer championship meets! The Elite 2 Senior Group did a great job at the CDSC New Year Invitational swim meet. A number of the swimmers had a full schedule with 10 events over the 5 sessions and were pretty tired by the end of the weekend. Their ability to persevere and race hard regardless, comes from a combination of mental toughness and endurance training. Both of these skills are ones we are focusing on lots in workout and the more workouts you attend the better you will be! Karim Fahmy and Lily Girard both had some standout races over the 3 days and came home with 100% best times! As we head into the next 2 months of meets this group is looking at competing at multiple championships and training together to help each of them reach their goals. January was a busy month for all, please make sure to keep on top of your school work so when at your championship meet(s) you can focus on that - being at championships! Time management is not something that is easy but it will help you indefinitely throughout your life. Staying healthy is also something the group needs to make sure they are working on. Please make sure to be dressing appropriately, getting enough rest, NEVER sharing water bottles, and washing your hands regularly. February was jam packed with swim meets almost every weekend. At the beginning of February we had LMR Championships for 7 of the Elite 2 Senior athletes. Highlights include best times for Karim, James, Julian, Jack Chen, Lily and Jack Wang, along with 2 new provincial cuts for Jack W. in the 100 and 50 Free. Derek was our group’s only swimmers at Age Group Provincial Championships and made the most of it coming home with 100% best times and 5 medals! Great swimming Derek! This past weekend at BC Provincial Championships Derek had another standout weekend with 100% best times and a new Western qualifying time in the 100 Breast, making it into the B final at night. Tia, Kelvin, Nathaniel and Jack Wang also came home with multiple best times after a long weekend in Kamloops. March is always a bit of a reset month just past the mid point of the season. Take your break from the pool and come back ready to go both mentally and physically for the remainder of the season. As always if you have questions, concerns, or would like to talk about your goals please make time to come chat! The first Age Group Championships of the year is just around the corner. Our meet last weekend gave us important information to finalize our preparation. Overall the Elite 1 junior swimmers did well. They showed us that they liked racing. Some have achieved greater feats like Jerry with 5 new club records, Alexia with 1 new club record, Chihana and Mutsuki with 3 new Tier 1, Gabriella and William with 2 new Tier 1, Ava and Josh with 1 new Tier 1, and like Ruby and Austin who swam their first 800 free and who can proud of their time. We did many best times and… some mistakes. We also want to say thank you to coach Helene Black who helped us during the meet. The new swimmers in our group now seem adapted to the practices, the spirit and the dynamics of our group. We will take the next few weeks to refine our techniques and to make new allies: the focus and the wall. We will work hard to improve more and more our turns, our final touches and our big kick. Let’s keep our motivation, our confidence and our enthusiasm! Elite 1 Junior swimmers, what an awesome success at our first championships of the year!! I am really proud to have seen you working together as a team during the meet using the energy, the intensity, the success of each other to raise your own performance. Since the beginning of September we were preparing us for this Championships. We have set goals and your achievements have reached even beyond our aspirations. And… motivated by this success, we are left for another great accomplishment at the summer championship in June. Because several swimmers have joined our group in the last months, I will hold a meeting to explain to new parents the year’s plan for Elite 1 Junior on Thursday April 11th. At the CDSC New Year’s Invitational every swimmer was able to achieve at least a few best times. The overall performance of the group was very good with some swimmers taking off large chunks of time in various swims. Most swimmers continue to show an improved understanding of the strokes and have much better technique than they had previously. These improvements over the season have been coming along nicely and I look forward to seeing even more improvement. We are now getting ready for LMR Champs which is just over a week away. This is the first big championship meet of the year and I look forward to everyone racing hard and swimming fast. There were three racing opportunities for the swimmers in Elite 1 Senior. The first was a Time Trial that CDSC held for our swimmers. There were some very good swims at the Time Trial. There were quite a few best times and some very good racing was shown. A highlight was that Teodor Bekri obtained his 6th Age Group cut in the 100m Freestyle. The second competition of the month was LMR Champs. Although many best times were made recently at either the Time Trial only a couple of days prior and at the CDSC three weeks before, there was some very good racing. Every swimmer obtained at least one best time and most swimmers moved up from their original placements. The big highlights from this meet were the multiple top 8 finishes from Zachary Bordan and Joshua Rosarion. Upcoming in March is Spring break and the Spring break training camp. Hopefully everyone enjoys their break and comes back ready to train hard as we go into our last training block for the year. I would like to welcome everyone back from the Holidays, hopefully everyone had a great break. We have kick started the new year with a bang. We hosted the New Years Invitational swim meet at our very own pool and wow what a success it was. 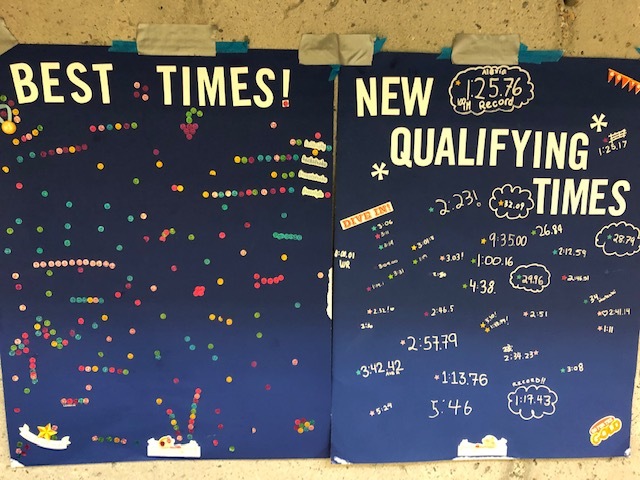 Swimmers had huge drops in time and we have a few new qualifiers. I would like to congratulate all Red 2 swimmers that attended! Our new qualifiers (BC Age Group Championships) are Avery Austin, Zack Russel and Julius Cheung. I would like to remind everyone to please sign up for the two upcoming meets. LMR Champs and BC Age Group Championships. These are championship meets and I would like to see everyone attend. Anyone still looking for qualifying times for BC Age Group Championships has a final chance to do so at LMR Champs. Hopefully we get a few more qualifiers! I would like to thank all the hard work from all the volunteers that made our annual meet a huge success. We are also hosting this years BC Age Group Championship in a month and we can build on the success we just had hosting this meet. Wow what a busy past few months we have had. Red 2 has attended their two Championship meets in February. LMR Champs was a huge success as we saw many best times and lots of medals. We saw multiple swimmers from our group perform very well and as a group had over 90% best times. Great Job! Following LMR Champs we had two of our swimmers participate in the Winter Age Group Championships. Avery Austin and Euegene Chang got valuable experience at this meet learning what it takes to race the entire province. CDSC had a great meet and we were able to place 3rd in the province! We are now moving into our next training cycle and will be working hard in practice through to spring break. Please refer to our website for the spring break schedule. Our next swim meet will be Langley Invitational. Meet information and sign up. If you have not yet signed up please do so as soon as possible. We are now moving into our next training cycle and will be working hard in practice through to spring break. Please refer to our website here for the spring break schedule. Our next swim meet will be Langley Invitational. Meet information and sign up can be found here. If you have not yet signed up please do so as soon as possible. I would like to personally thank all the parents and swimmers that volunteered at the meets we hosted over the past 2 months. Your generosity and time are greatly appreciated! We are off to a great start to the New Year and with LMR champs just around the corner we are getting to the grind. We are going to be focusing nice and fast streamlines off each wall getting 10m off each wall. I would like for Red 1 to do 20 sit-ups a day followed by a 1 minute plank alternating on and off days in efforts to work on our core strength. This can be done before bed or at any point that free-time is available. Great job at the CDSC Meet! Our first meet went nicely with our qualified swimmers in the CDSC meet. To those who have yet to swim we will be participating in the CHENA meet. We have been focusing on a more powerful and present kick. If we keep up our good efforts we will have a good meet! I would like Blue 2 to do 10 sit-ups a day followed by a 30 second plank alternating on and off days in efforts to work on our core strength. This can be done during any free-time available. We are getting back into our routine. Our timed kick will be coming up soon. Our last year went very well and we made a lot of progress. We are working on activating and using the core in swimming and being able to control our breathing. This will be done by completing numerous specified exercises throughout our workouts. This February we have been able to get a better grasp on breaststroke kick. We focused on looking less like frogs in the water and more like water bugs moving through the water. We also did some work on backstroke and rotating our shoulders/hips properly. This March we are attending a PASS meet on the 17th, however our last practice will be on the 14th and we will return to regular schedule Monday the 25th. February started with getting a proper finish into our backstroke and finished with keeping our kick narrow at the knees in breaststroke. We also made some progress with our timing in breaststroke and bringing the stroke more forward in the water. We have also worked on our freestyle and dolphin kick. This March we will start our spring break on the 14th, and are attending a PASS meet on Sunday the 17th, our regular schedule will resume on Monday the 25th. Hello to all swimmers and families! The new year has already started quickly and we are going to be very busy over the next few months to continue to focus on great swimming skills, endurance and team building. I want to thank everyone who helped out at the CDSC meet and made sure that we were able to put together a great meet. Everyone contributed in many ways and I want to thank you and say how lucky we are to have you on our team! A special thank you to the coaches, board members, swimmers and volunteers. The first CDSC Pass and Mini meet of the new year will be on February 17th (Sunday morning). If your child is in Blue and up they will be racing in the early morning from 5:45-8:15am. If your child is in one of the White groups they will be racing from 8:15-10:00am. If you have not yet signed up please do so now so you do not miss the deadline. For all swimmers in Blue 1.1,1.2, White 1.1, 1.2, and Junior Dolphins we will be taking a break from Monday March 18th - Sunday March 24th for Spring Break. We will be back in the water on Monday March 25th with regular scheduled practices. Over the past five months our groups have shown great improvement and we should keep the momentum going for the next several months. Since the cold weather is already upon us we need to make sure to keep warm, wash our hands regularly, and remember a water bottle and sandals at practice. Please join me in congratulating the swimmers in Blue 2 and up who stepped up at our CDSC New Years Invitational and won the entire meet; showing the other clubs from the area that we are here to race and have fun! Looking forward to many successful swim results from the upcoming meets and great team work from all. Thank you to all the coaches working with Blue, White and Junior Dolphins. It has been a crazy 2 months of Jan and Feb. I wanted to thank every one of you for supporting our CDSC New Year Invitational as well as coming to help at Winter Age Group Championship. Last year 2017-2018 our swimmers attend the meet and we came 5th place over all. This year with all you guys support, and our own CDSC Swimmers we reached to 3rd place over all. Our girls swimmers where top in BC. Even though we had only 26 swimmers and the second place team had 36 swimmers we were only 13.5 points behind the second place. We are very proud of our team and I trust without you and your children we could not be able to achieve such a great results. We also had many swimmers from Blue 1.2 moving up to Blue 2, as well as swimmers from White 1.1, to White 1.2, from White 1.2 to White 2 and from White 2 to Blue 1.1 and from Blue 1.1 to Blue 1.2. We all coaches congratulate you and your children for achieving to higher group and looking forward for more coming in the next few months. Our spring break will be Monday March 18 to Sunday March 24. Please note swimmers who are in Blue 1.2 practice for March 25 and March 27 will be changed to March 26 and March 28 only for the date mentioned. Sunday March 31 practice will be as usual for all swimmers. We are back to fully normal practice as of Monday April 1st. Over the past 3 months we have been working Starts, Turns and endurance as well as lots of drills. We are hoping all these pay off over the next few months and looking to see your child achieve their goals and mastering their skills. Both Junior 1 and Junior 2 groups have been working on their racing skills with 25 yard sprints fluttering kicking. They are learning what it means to compete and be a member of a team. They have recently been working on their breaststroke kick with incredible performances by many. With the on deck workouts and the pool time they have come far since January. Way to go Juniors! We will be moving into more circle swimming and taking everything that we have learn thus far and incorporating it into our practices. We have some new drills, otherwise known as surprises : ), coming up so make sure you don’t miss any practices as we will be developing some new skills in this next part of our season. Keep up the great work Juniors! Over 100 best times at the CDSC New Years invitational and lots of new qualifying times and records!! Each Month we will be featuring a different coach so you can get to know them better. Our first meet the coach feature for the new year is the wonderful Helen Black! Helen coaches White 1.2, Blue 1.1 and 1.2. The most inspiring part of my job is witnessing the positivity and dedication present within the CDSC team! I wanted to be a teacher or a veterinarian because I’ve always loved animals and group environments. 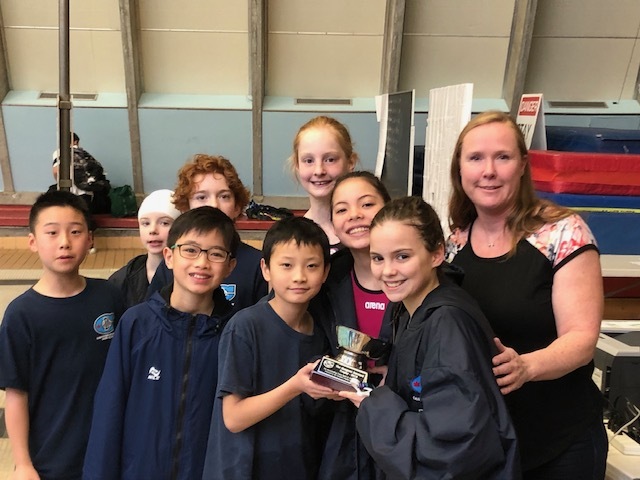 Each year at our CDSC Invitational we award the Marg Durward team spirit trophy to the team that best embodies teamwork, team spirit and camaraderie. This award is meant to honour not just the swimmers, but also the officials and volunteers who support the team. This year team cheers were a big focus for the Dolphins and all that cheering paid off! Yannick Morgans for being the best cheer leader we could’ve hoped for and always making sure there was a ‘Let’s Go CDSC!’ when our swimmers got on the blocks. Jack Porter timed for multiple sessions during the meet and could always been heard cheering on ALL the CDSC swimmers in the pool. Leandro Ang was another excited parent volunteer who was always cheering for the dolphins regardless of if he was timing, taking team photos, of helping out with countless other jobs! Thank you again to all our supporters over the weekend! We couldn’t have done it without you! Interesting Reads, Tips and Videos! We’ve been talking a lot about nutrition with our athletes and since all of the swimmers still live at home - it’s important to educate the parents as well! Here are some great resources and videos that talk about proper nutrition for swimmers. Most of the conversations I have with swimmers are about when to eat and making sure that food is fuel for your body. I’m never going to tell an athlete to stop eating but I will talk about how eating the right food is going to provide their body with the nutrients needed to keep up their training and work load. If you have specific questions about these topics or a swimmer’s nutrition in general please don’t hesitate to reach out - if the coaches can’t answer your questions we have resources with local athlete nutritionists who can! CDSC Swimmer of the Week! Due to our newsletter only happening once a month, we wanted a new place to showcase our amazing swimmers of the week in our developmental levels. Check out the yellow bulletin board on the side of the office at VAC to see CDSC’s Swimmers of the Week featured with photos! If there is any other news our membership is interested in hearing about please let us know so we can make sure to add it to our communication! Please talk to your coach for specific training times. Red 2 Groups and Up. Blue 2 and Red 1 Groups. Elite 1 Junior Swimmers only.